Have you ever had Bart's? No? Didn't think so, not unless you live in the Massachusetts area. Apparently Bart's is "Massachusett's finest homemade super premium ice cream since 1976". Funny, I've lived here a long time and only just now have I finally had a pint of Bart's. I won't get into too many details since they are pretty localized, but basically Bart's super premium pints and Snow's Half Gallons come from the same factory in Greenfield, MA and they've been doing so for quite some time. Deep Purple Cow? 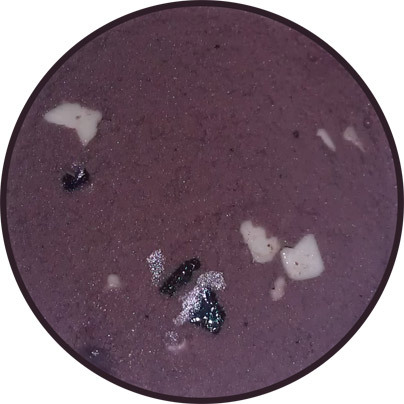 Since Purple Cow is black raspberry and chocolate chips, Deep Purple Cow is black raspberry with white and dark chocolate chips. 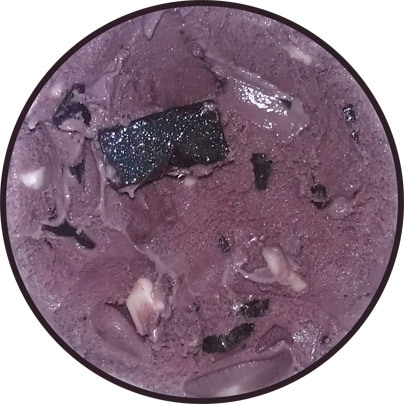 As a lover of black raspberry ice cream, I feel a bit uninformed and needed to do a quick google search about this.... Funny, all my search results are for Emack & Bolio's Deep Purple Cow flavor and no one else seems to make it. Weird, it looks icy doesn't it? And check out that deep purple color! Hehehehe, I'm glad it's that shade because otherwise the name would just be a lie. If you are going to rock a name like Deep Purple Cow, then you gotta deliver the color. Well it's still soft from the ride from the store (despite being in my lunch bag), but I don't know if I can call it creamy.... or maybe I just can't call it creamy because I keep running into chunks upon chunks of chocolate. The black raspberry puree flavor is pretty strong. I'm glad it's real flavor and not artificial, but it's a bit stronger than I prefer. At first I thought that maybe the white chocolate was adding a funk to the whole thing, since I suspected the same thing of Schwan's white chocolate chunks. However, after many scoops I realized it was just me settling in to the puree flavor. I'm just use to the more mild black raspberry from brands like Turkey Hill and Friendlys. After getting use to the base, it was time to mess with the chunks. First I had some very nice dark chocolate chunks. Good good. They aren't trying to be some fancy imported super dark 72% cacao adult nibblets, they are just trying to be simple and tasty. I moved on to white chocolate chunks and those are nice and mild too. Again, simple, nothing fancy, just white chocolate. I'm really enjoying the chunks though I am cheating a bit. Sometimes I aim for just dark or just white so that I can get a good flavor build up from just one or the other. Oh yeah, that was fun and I'm guessing the short ingredient list had something to do with that. Now granted I prefer my black raspberry a bit more subtle and sweet, but man the chunks totally sell this flavor. Both the dark and white versions taste great by themselves and how can you possibly not have fun when you scoop down and pull up 5 squares of white chocolate? or a big chunk of mild dark chocolate? My only regret here is not eating slower. On Second Scoop: Wow, I cant remember the last time I fell asleep thinking about ice cream, but man I couldn't get this pint out of my brain last night. I decided the second half of the pint would be my first snack of the day, so let's dig in --- and it's gone. Oh that was fun, though again I do regret not eating it a bit slower. Yes, personally, I still think there's a smidge too much BR puree, but I'm guessing that's where all the color comes from so that might explain things. 2015 Update: My in-laws served this with some cake yesterday and man, it was even better than I remembered. I don't know if they tweaked the formula a little, but it was spot on. Just flavorful and full of chunks. I need to get more Bart's on the blog! Verdict? Gotta love the chunks! I doubt that this will win any awards for beauty. Seems very similar to graeters black raspberry, but you didn't mention it...are they close? preference for one or the other? hehehe, you got me man. I actually did want to compare the two and forgot. Looking back, I would say they are similar because of the black raspberry puree. The graeters has that unique texture, but this one is so full of chips it's hard not to love. I'd go with this one. surprised to hear that, I'm having trouble believing there were more or better chips than graeters - those things are like huge chunks of fudge. (currently) I prefer these smaller and more numerous chunks because they are much more consistent than Graeter's offering. I mean, Graeters is fun to look at, but when the chunk is bigger than your spoon, things get complicated. 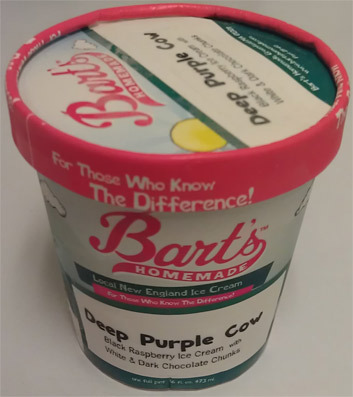 Bart's is a classic in Western Mass, but people are pretty divided between that and Herrell's, our other local classic. Rumor has it they invented cookies 'n' cream. ;-) It's my absolute favorite- you should check out one of their scoop shops!